Persian Filet Mignon Kabob (Kabab Barg) is typically something special that you can only enjoy in a Persian restaurant. But with this recipe, you can create this at home. 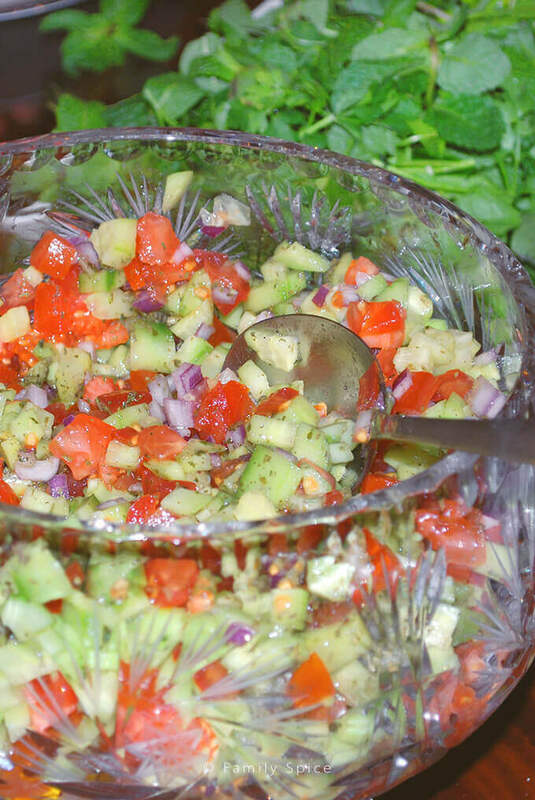 Find more of my Persian kabob recipes. Family dinners have different meanings for every family. I am half-Iranian, half-American and I married a man who is full Iranian, but very American. Make sense? Our family parties are not small. In most middle-eastern cultures, if you are related as little as a drop of blood, you are considered family. When your husband’s sister gets married, her in-laws are now your family. My cousin’s son’s fiancé’s parents are now a part of my family. Distant cousins are as close to me as first cousins. My grandmother’s first cousin, is a dear “uncle” of mine. So with these definitions for “family.” family parties take on a whole new meaning! My husband and I are also blessed to be living in San Diego, California. While the rest of the country is freezing, we suffer through 50ºF winters. Brrrrr! Except for a week of rain, we are sunny and 73ºF most of the time! Last night my husband’s family was together for one of our family dinners. We gathered together to celebrate my mother-in-law and father-in-law’s return to the U.S. after a two-month visit to Iran. Yes, that’s a reason to throw a party. 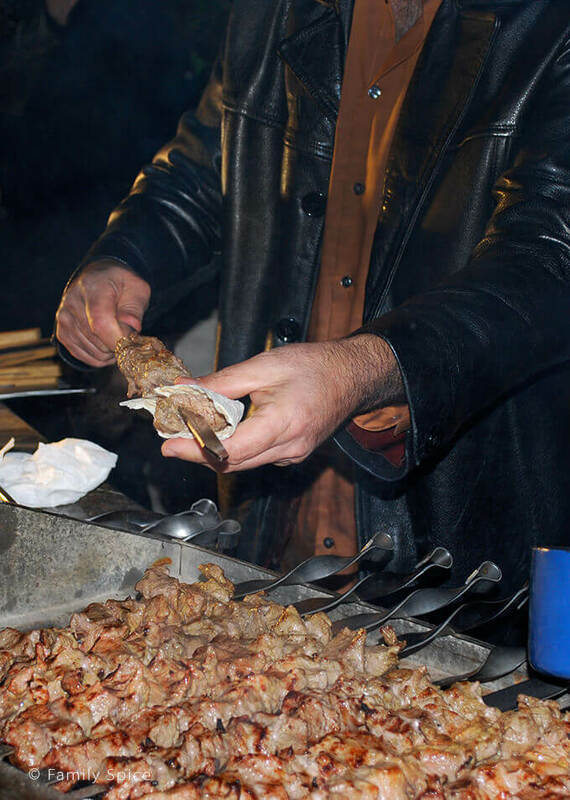 And the best way for us to celebrate is with a Winter Barbecue – Persian Style, with kabob. You have probably heard of kabobs, maybe even made your own version of it. I have seen it spelled in many, many unique ways. 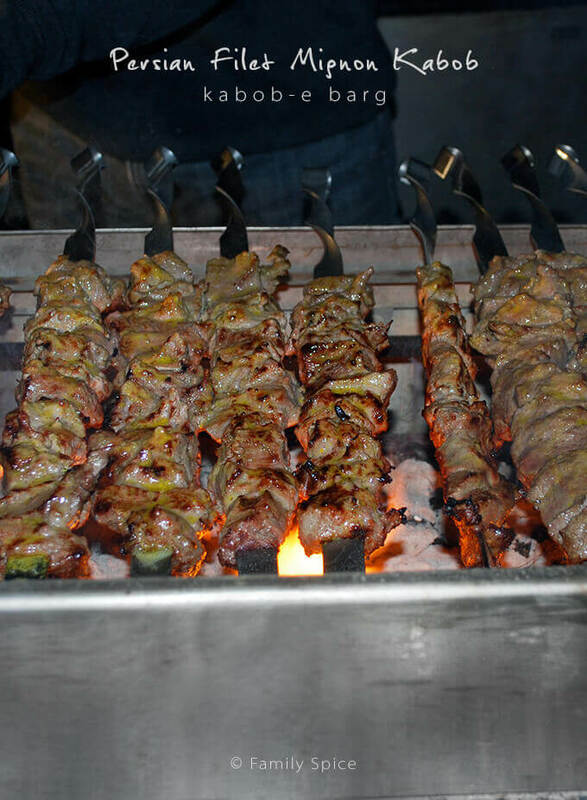 When you mention kabob, most people envision Turkish shish kabob, the classic chunks of steak on skewers with onions and peppers. 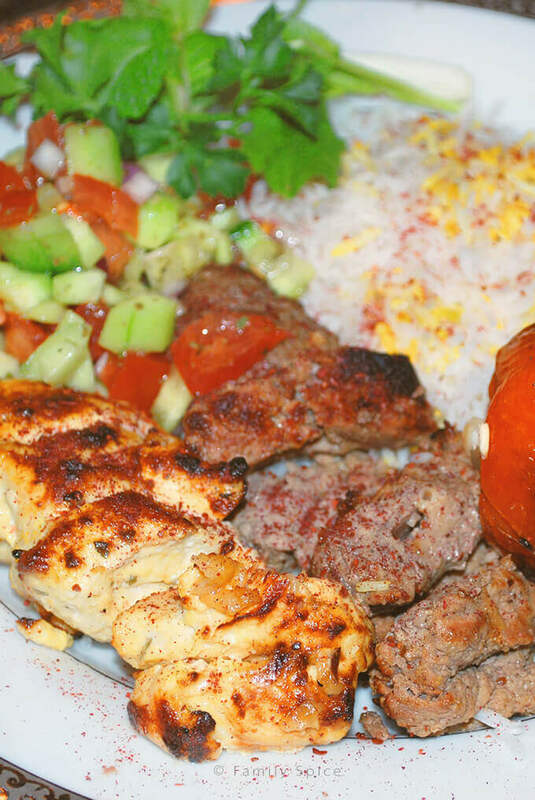 Persian kabob is a bit different, but is more than just meat on a stick. 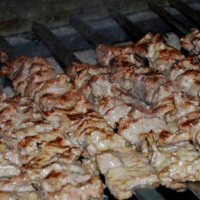 Varieties of meat are marinated then skewered and grilled. Persians typically serve kabob with grilled tomatoes, which are also skewered and grilled. In last night’s case, we made kabab barg (filet mignon), kabob koobideh (ground beef kabob) and joojeh kabob (chicken breast kabob). Each are marinated differently, and each are equally delicious. And with cousin Babak manning the grill, my husband’s cousin, no one turned down the invitation to this family barbecue. 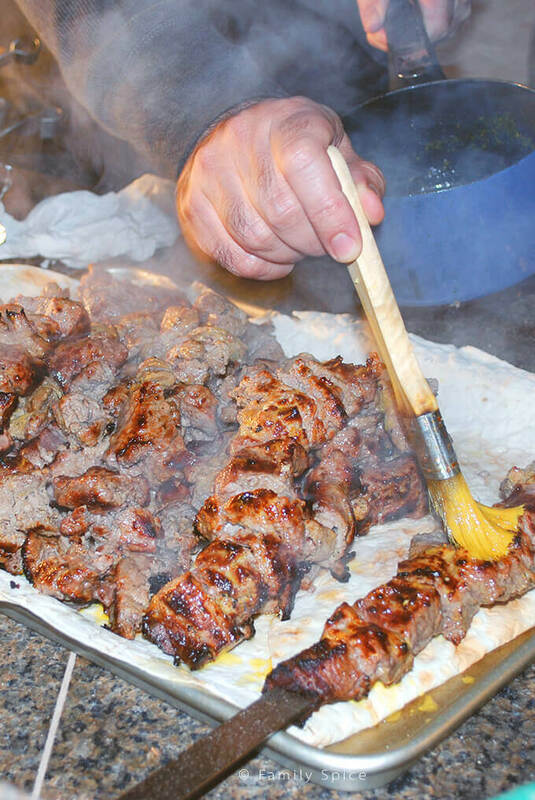 Whether you are preparing barg kabob or one of the other Persian kabob varieties, the meats are prepared and marinated one or two nights before the big day. The kabab barg and joojeh kabob were marinated similarly: onions, garlic, yogurt, saffron, salt and pepper. The filet is cut thin, about half-inch thick while the chicken is a big chunkier, about 2 inch chunks. No skinny sticks for these kebabs. 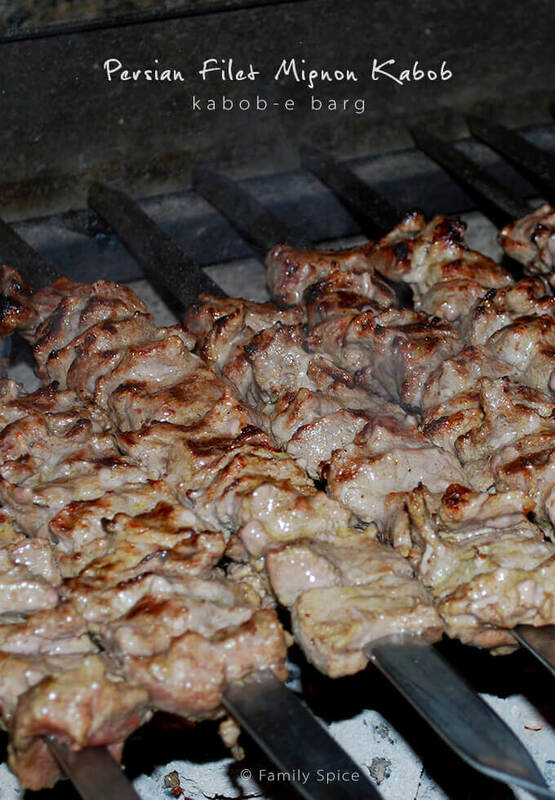 Persians use long flat metal skewers for ours, and one skewer full of meat is a lot for one person to handle. In our culture, more isn’t just better – it’s a must. And way too much food is just right! How much kabob meat for one person? So calculating how much meat per person can be a challenge, depending on how generous you want your portions to be. On average, I usually measure about 1/4-pound per person. But since we are Persian, and we love our kabob, we measured approximately half a pound of meat per person, but I’m sure I ate more! What kind of grill do I need for kabob? Cousin Babak had his barbecue custom built for kabob grilling. You do not need to do this. 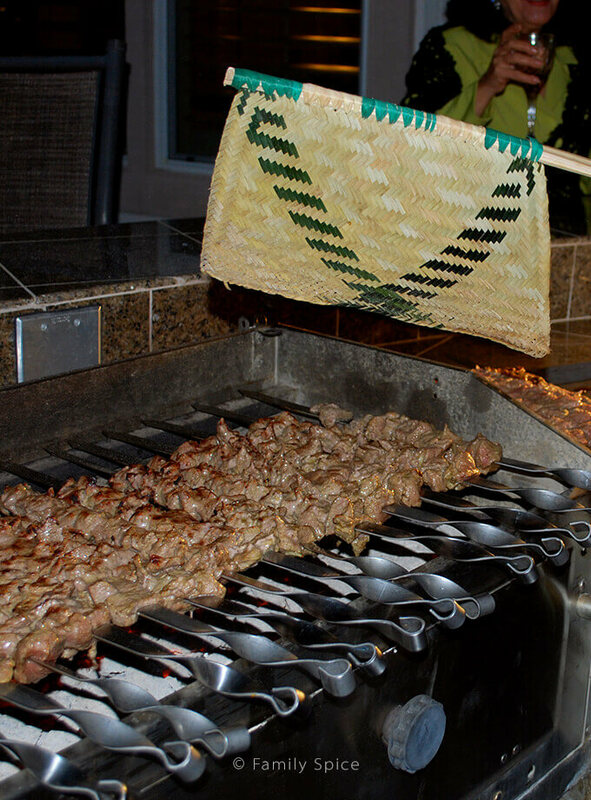 We grill our kabob in simple stainless bins, the kind you find in restaurant supply stores for buffet meals. If you have a grill rack, remove it so the skewers can rest freely above the fire. No propane or gas tanks get used for grilling kabob though. 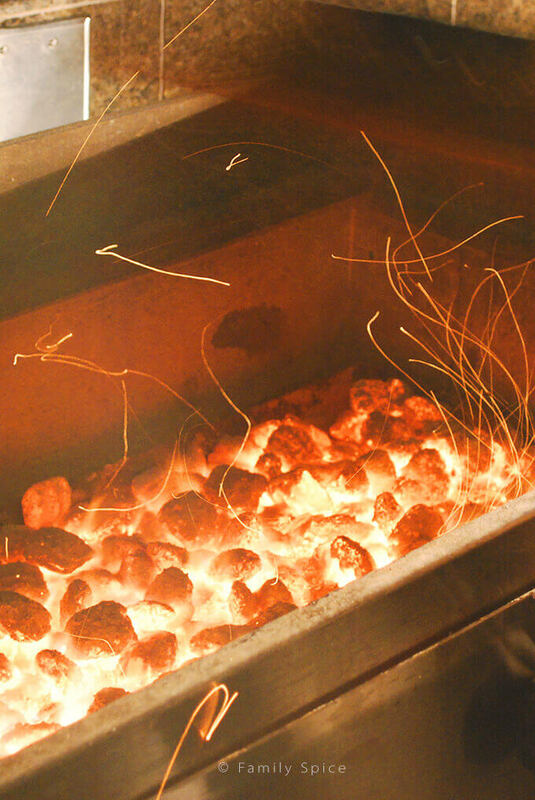 Hot coals are a must for kabobs, so there is some down time while you wait for your coals to heat up. You are also constantly heating the coal by fanning the flames (see photo below). 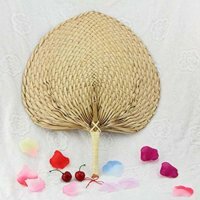 It might be a throw back to a primitive time, but almost every Iranian’s home, especially one who grills kabobs, has a straw fan to fan the flames by hand and keep the coals burning hot. Do I need to baste my barg kabob? My husband, Reza, is the assistant when Babak is outside grilling our kabobs. I often wondered what the men were doing, while we women were inside laughing, setting the table and getting the rest of meal ready. The mystery was revealed last night. The men were drinking, laughing and eating the kabob fresh off the grill, wrapped in small pieces of lavash. Pictured above is my man pulling off pieces of kabob barg from the skewers for a little loghmeh (bite) to enjoy. The meat is basted regularly with a mixture of melted butter and saffron. It keeps the meat juicy and oh so full of flavor! Remember, this is not just steak on a stick. I observed these two grown men coordinating the basting, the kabob – turning and sliding the meat off the skewers. I was impressed. They really knew what they were doing! 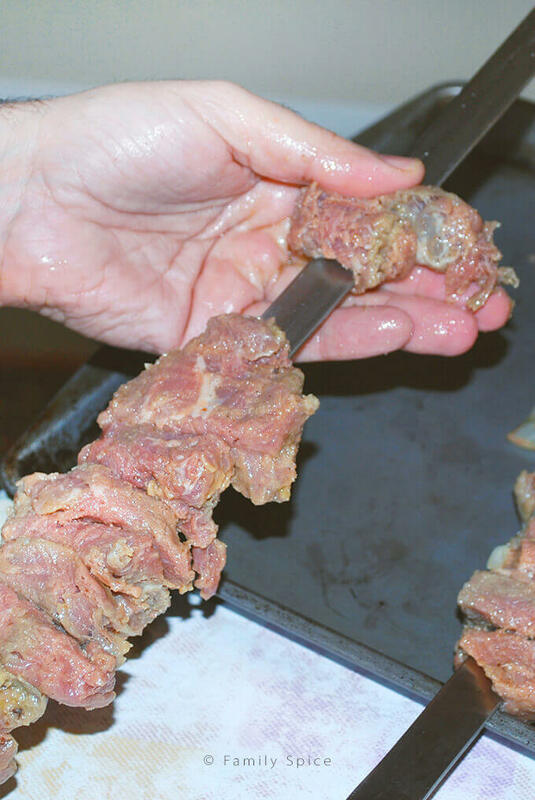 There is a special technique to removing the barg meat from the hot metal skewers. 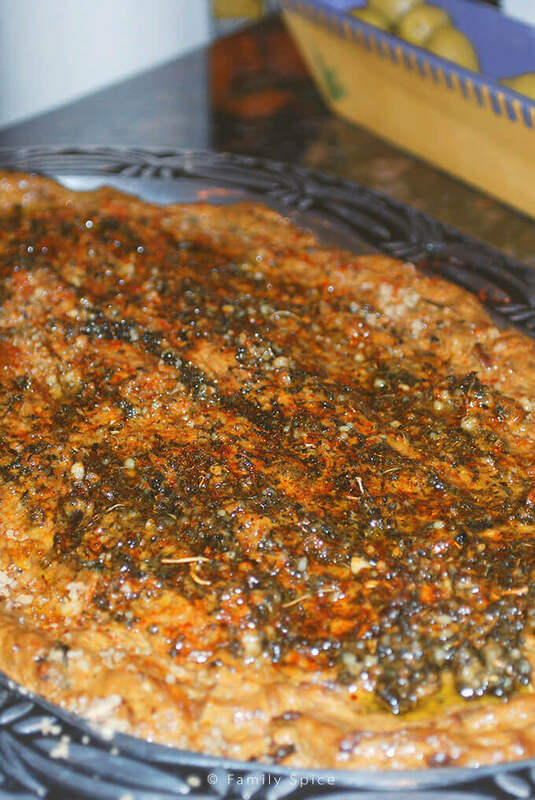 After grilling the kabob, use a piece lavash bread to grab the meat and slide it onto your serving platter. Usually, your serving platter is lined with another big piece of lavash and kabob rests over it, covered with another piece of lavash! The top piece of lavash keeps the meat warm, like a blanket. The juices from the meats get soaked into the bottom layer of lavash. During dinner, everyone fights for those juicy pieces of bread. All three meat kabobs are served with white basmati rice, grilled tomatoes, fresh herb and feta platter, lavash bread, and salad shirazi (cucumber-tomato salad). 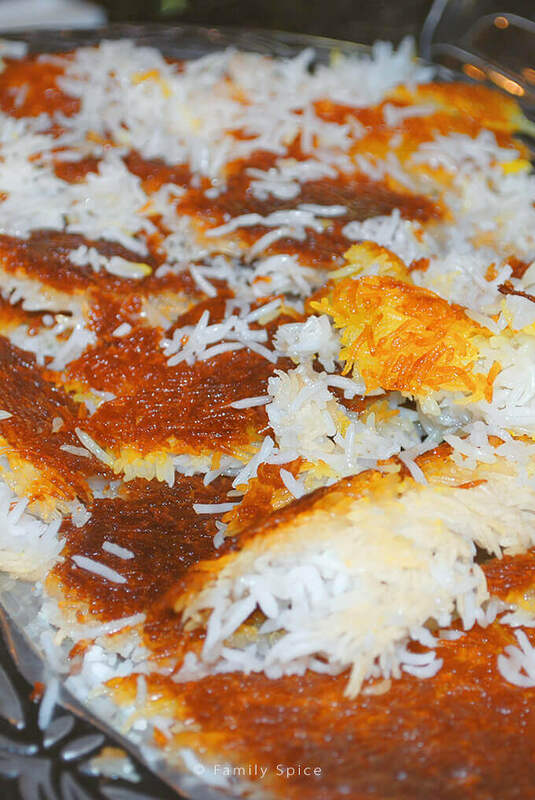 The bottoms of the rice pot holds the cherished crust, tahdig, that everyone fights over. 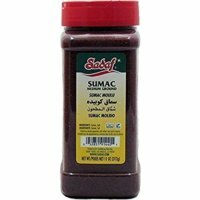 Kabob is also served with sumac, a dark red spice that offers a great tang to your meal. Some people just use a sprinkle of sumac while others have their foods coated in it. And just when you thought you were ready to burst, and you couldn’t eat any more, dessert was served. In my family, we like to have a little bite of something sweet, to help with digestion, we convincingly remind each other. 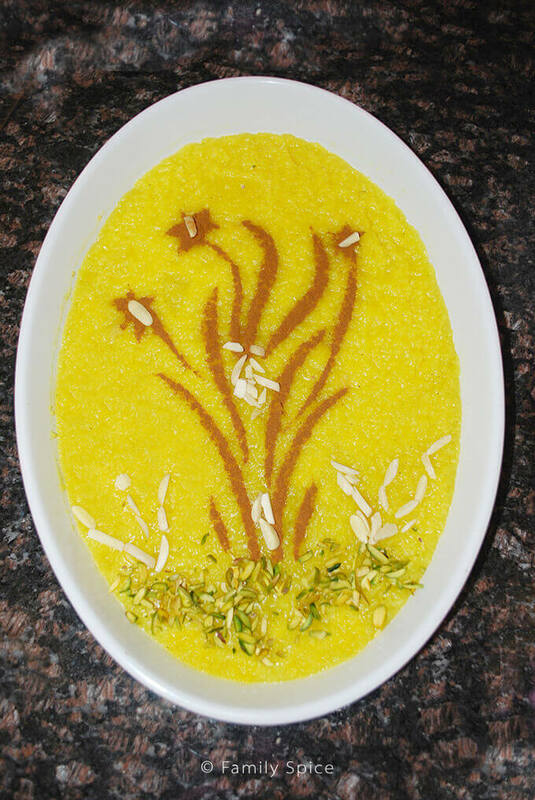 Whether a little bite or a big one, we served these popular Persian desserts: Napoleons (influenced by the French), Persian Baklava (made with rose water syrup) and Sholeh Zard (saffron rice pudding – pictured below). And of course, dessert is served with aromatic and delicious Persian tea. Perfection! In total, we had about thirty people over last night for a night of kabob and good times. We all came hungry and left totally stuffed. Everyone was full of compliments and offered sage advice (“Laura, your sholeh zard needs more saffron”). My mother-in-law used her creative talents to help me garnish our dishes. Alas, another family dinner was under our belt, even if we couldn’t keep that belt buckled around our oh-so-full stomachs. We said our good-byes, gave our hugs and kisses and vowed to workout extra hard the next day to burn off all the lovely food we ate. That is, until the next family dinner… later this week…. Maybe we can wait another week? I took so many pictures last night that I decided to put together this little slide show of our amazing evening, with beautiful Persian music provided by cousin’s husband (of course) Emad Bonakdar. Persian Filet Mignon Kabob (Kabob-e Barg) is typically something special that you can only enjoy in a Persian restaurant. But with this recipe, you can create this at home. Cut filet mignon into thin layers about 2-inches wide. Place meat in a large shallow container and mix in with onions, half of saffron liquid, yogurt, olive oil, garlic, salt and pepper. Coat all pieces of meat completely with marinade. Cover and marinate at least overnight and up to 2 days in the refrigerator. Start your charcoal at least 30 minutes prior to grilling. 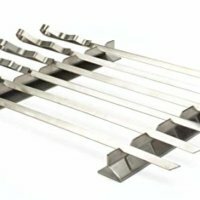 Slide filet pieces close together onto metal skewers, leaving room on each end of the skewer to handle without burning yourself. This also insures the meat is resting on the hottest part of your grill. Add butter and remaining saffron liquid in a small saucepan cook over medium heat until melted. Grill kabobs for 3-4 minutes each side, for medium-rare, turning occasionally and basting with butter-lemon mix. 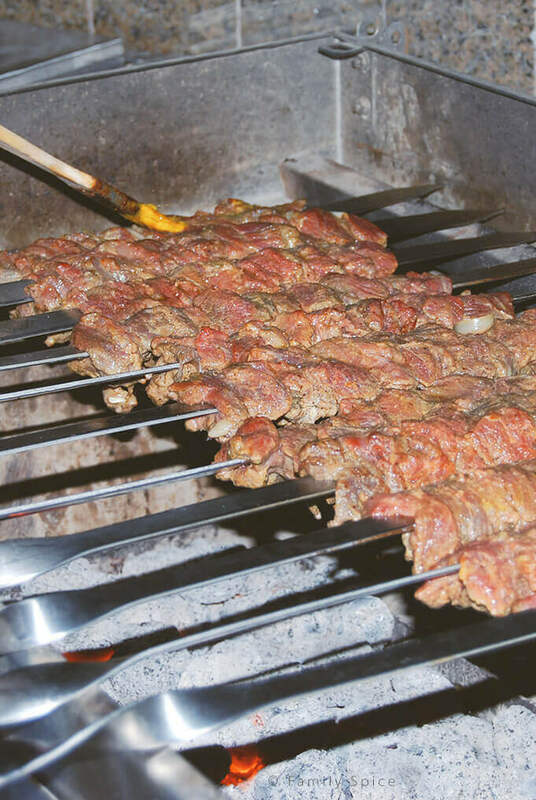 Remove skewers from heat and remove meat from skewers by grabbing it and sliding it down with lavash bread. Place meat on a serving platter and cover with another piece of lavash bread to keep the food warm. Serve with basmati rice and sumac. Copyright © 2016 Family Spice. All rights reserved.